Home \ Blog \ E-News \ Are You Out of Your Mind? When we are doing something that comes natural to us, we’re in the flow. Things go smoothly. We are productive. We feel in control. We rock! When left-brain people like me try to do right-brain activities, the result is stress. Please don’t ask me to draw a picture of anything – ever! I can barely create a good smiley face! Left brain people think in a linear fashion. They are good with details, organized, problem solvers and good with language and numbers. 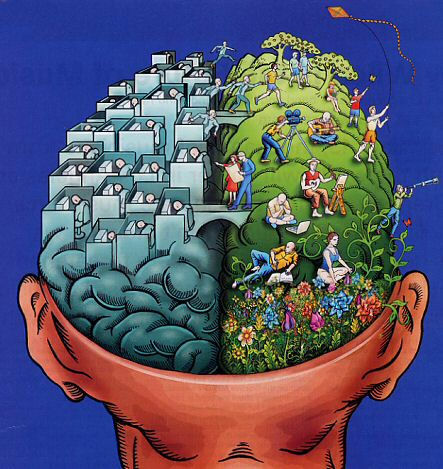 Right brain people think in a fluid fashion. They are good with pictures, movement, energy and the physical senses. They are creative. The bottom line is: Are you asking yourself to do something for which you are not gifted or even suited? If you are, you are out of your mind!